This is a neat video, done with time lapse. Kinda just runs along, then.. BALOEY! Redoubt Eruption March 27 2009 from Bretwood Higman on Vimeo. Turkish Airlines Boeing 737 crashed at Amsterdam Schiphol airport at 10:31 AM local (CET) time this morning, Februari 25th (8:31 UTC, 4:31 AM EST, 1:31 AM PST). Last edit: I am going to put this entry to rest, with my understanding of what happened. Do feel free to comment the hell out of it. Still, it’s kinda heartbreaking and shows again how only a chain of event leads to tragedies like this. The aircraft was piloted by the First Officer (FO), with the captain monitoring his performance and doing the non-flying duties. The FO was not hand-flying the plane. They came in a bit fast and high, but all within reasonable margins. Next thing, the left hand radio altimeter, a downward looking radar system, fails, indicating they are already touching down instead of being 1950 feet in the air. The crew notices this problem, but dismisses it as a serious event as the barometic and the right hand radio altimeter indicate the correct position. The autopilot (or to be more precise the auto-throttle part of it) keeps the engines on full idle. The crew interprets this as getting rid of the fast and high situation but in fact the auto-pilot has determined they are almost touching the runway. The airplane flies through the decent path and starts flaring, read, pulling up the nose to bleed off airspeed while “hugging” the runway, that of course in reality is NOT under the tires. Things go fast now. The FO notices they are decending though the expected glidepath and that they are loosing speed rapidly. He grabs the throttles and slams them forward. It take a couple of seconds before the engines spool up. The captain is now also aware of a serious problem. He calls “my plane” taking over control. The FO removes his left hand from the throttles, assuming the captain to takes them. Things might still have been recoverable at this moment. Unfortunately, the autopilot system still “thinks” they are flaring and with no hands on the throttles, they are retarded once more. It takes the crew six vital seconds to realize this horrible mistake. They slam the throttles forward once more, but it is too late. Before the engines can power them out of this situation, they slam in the mud with hardly 100 knots (aprx 120mph) forward speed, the nose pitched up high and in a full, deep stall. The Flight data recorder had 25 hours of flight on them, in 8 flights. In those 8 flights, twice more the left radioaltimeter failed. Had the left hand altimeter been properly repaired, or…. had it not failed at that crucial moment, or…..
had the crew recognized this as a serious event, or…..
had the captain not taken control, or…..
had the captain taken over the throttles immediately, or…..
had the crew hit the TOGA (Take Off Go Around) button, or even simply disengaged the autopilot…. this horrible incident would not have happened. May all that passed away rest in piece, and all the wounded, both physically as well as mentally recover soon. Mar 4: First preliminary results from the OvV: Plane was on full auto pilot (AP), but the left radio-altimeter was defect, indicating the aircraft was already on the ground (-8 ft when the actual height was 1950 ft). The AP then throttled back to flare the airplane on the runway that simply wasn’t there. Pilots intervened too late. Mar 1: The video in this page, made on the day of the crash, gives a good impression on the damage to the aircraft and the incredibly short debris track. I doubt it being more than 3 times the length of the aircraft. This is another indication of the very slow forward speed (reported by GPS derived data to be only 83 knots = 154 km/h = 95 mph). Mar 1: Status: 44 in hospital, one still in critical condition. Mar 1: The wreckage will not be removed today. The investigators need more time and it will be Tuesday earliest. Mar 1: Some more background on the legal versus safety argument here and here. Feb 28: It is now confirmed by Boeing that all 4 Americans on board were Boeing employees, of which 3 perished, and one is still in hospital. Of the badly injured, one is still in critical condition, the others will survive. It is not stated anywhere that this last person in critical condition is in fact the 4th Boeing employee. The 4 were all sitting in the front of the aircraft. Turkish pilot association Talpa claims the wake of the 757 that landed before TK1951 was probable cause and is said to blame ATC. Again, this is all speculation. As far as is reported, the 757 and this plane were separated 2 minutes, which AFAIK is sufficient. Maybe a pilot friend can comment on that. Two of the 4 Americans that were killed in the accident were Boeing employees. The OvV has refused to give the justice department, who is conducting a separate investigation focused on liability (guilt), access to the black boxes. Safety Board officials feel witnesses will not be able to speak freely if they feel their statements could be used in a criminal investigation. Traditional “FBI vs NTSB” conflict, if talking in US terms. The justice department is not amused being flipped the finger. The flights First Officer (often called co-pilot) was on this flight to familiarize himself with this particular (sub) type, which was also reason for the jumpseater. Let me stress that this is not “learning to fly”. The guy was flying airliners since 2004. It has not even been established that he was actually flying the airplane, if it was in any auto-pilot mode. That is all speculation. The plane is supposed to have had some technical issues in the last couple of days. An aborted takeoff on February the 23rd, after flap issues the 18th. The 9 killed: 5 Turkish, 4 American. From the 6 badly wounded, 4 are still critical (but made it through the first 24 hours). The “Onderzoeksraad voor veiligheid” (OvV, Dutch Safety Board, roughly the Dutch NTSB) started its investigation immediately after the crash. The black boxes haven been sent to Paris for analysis. Preliminary results expected after the weekend. Crew was reportedly crushed by the instrument panel buckling forward in the crash. One fatality At least nine fatalities, 20 50 86 wounded, of which 25 severe, 6 in critical condition. 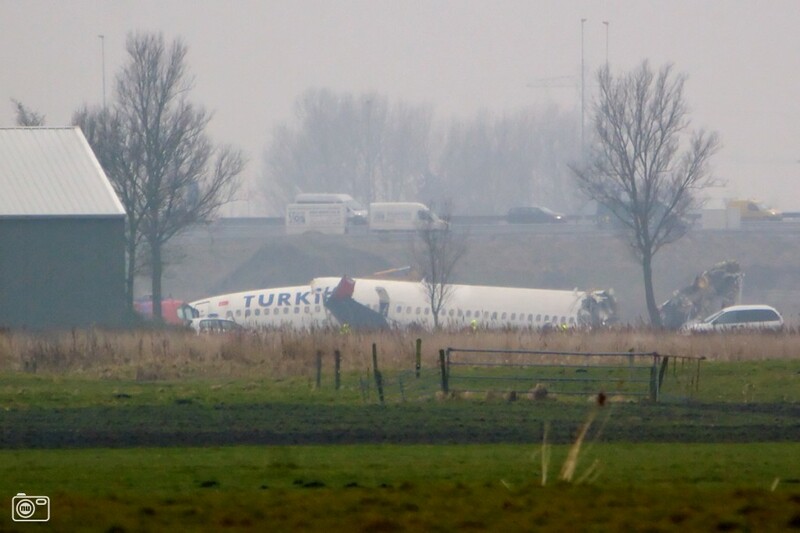 ASN reports: Turkish plane crashes at Amsterdam-Schiphol. 135 on board. Presumably TK1951 from Istanbul. B737-800 TC-JGE. No fire reported, airplane broke in three. Airframe is sitting next lined up to the “Polderbaan” (36L/18R). At least 50 walked off unharmed. One engine ripped off. Audiovisuals here. Location on google maps here. Note the site being lined up with the runway. CNN have reported it an Airbus 380. Typical. All three cockpit crew (one jumpseater) reported dead and still trapped in the aircraft. They are not being moved, probably because they are stuck, but maybe even more importantly, nobody wants to flip a handle or switch by accident that could invalidate the investigation. Speculation part: very short crash path and described as “fallen out of the sky”. That would suggest a stall, which could have had several reasons. It’s been 13 years since the last airliner accident in my country, the crash of a historic Dakota (DC-3). The worst (in terms of within the borders) was El Al 1862, a freight 747-200 that crashed into an appartment block . If a Dutch aircraft involved is the definition, it’s histories worst aviation disaster ever, Tenerife.